N50° 49' 25" W001° 42' 02"
From terminal car park at Bournemouth Airport, drive south along the main service road towards the airport exit. At the 'T' junction with the main turn left to find the small roundabout at Hurn where you will need to take the last exit. At the traffic lights turn left which should lead you onto the main A338 dual-carriageway northbound to Ringwood and Southampton. After about 4 miles you will find yourself at the Ashley Heath roundabout. This is a large roundabout situated above the main A31 dual-carriageway which passes East-West. Take the last exit from the roundabout which will be signposted A31 Ringwood, Southampton. The slip road joins the main carriage-way where there are 4 lanes. Be sure to be in either of the outside 2 lanes as these will bypass Ringwood towards Southampton. After passing the Ringwood interchange, you will pass turn offs for Poulner, Hangersley and Shobley. Drive up a long hill towards Picket Post (which is located where there is a Shell service station on either side of the road). Turn off the A31 (White signpost to Burley about 2 miles East of Ringwood) passing a small roundabout by the Shell Service Station and a Little Chef. Take the next turning on the right which takes you underneath the A31 towards Burley. This will lead you south through the village of Burley Street and into the village of Burley (please mind the ponies and cows on the road! - thank you). 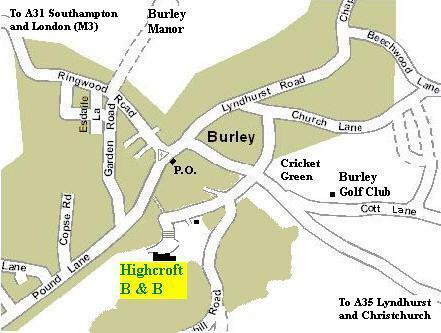 As you reach the centre of Burley, marked by a war memorial outside the Post Office the road bends sharply to the left and then to the right up School Hill towards Brockenhurst. At the top of this small hill you will see a green signpost on the right hand side for Highcroft. Turn right carefully onto a forest track and proceed with caution. After about 100 yards, the track splits into 3. Follow the centre track until you pass over a cattle grid and arrive in the front courtyard of Highcroft. Please use the main door, where you will be welcomed after your journey.